As we pulled into the bus station we were greeted with many Sri Lankan men running around shouting out to encourage us to purchase their wares. 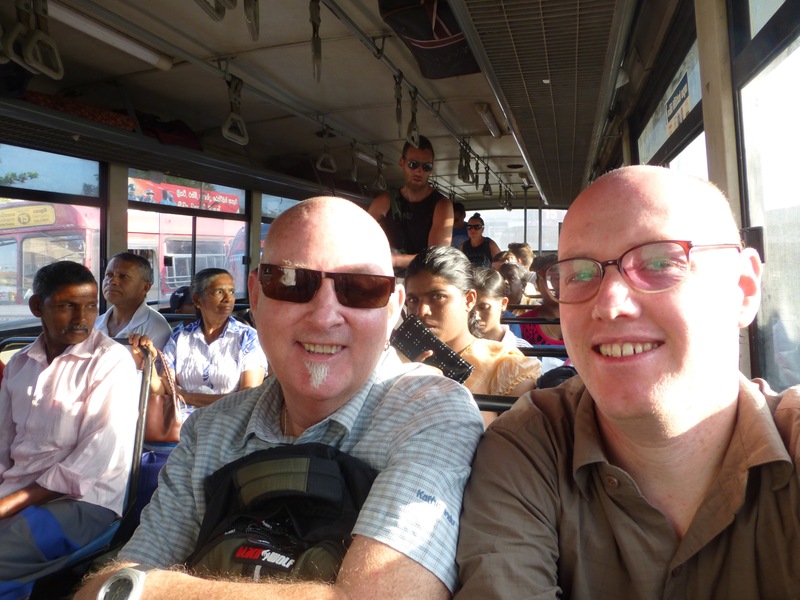 We declined and climbed aboard our bus which was taking us to Polonnaruwa. It was to be a four hour journey – one that we will never forget. Upon ascending the steep stairs, grabbing the well worn metal bars to help us up, the only two remaining seats were at the front on the left hand side so we quickly grabbed them. The smell of incense was strong and we noticed the driver had several sticks burning on the dashboard – at least our journey would be mosquito free. The bus gradually filled up with locals and the sellers also climbed aboard to allow passengers to buy last minute snacks. The ticket collector walked through and sold tickets which seemed to be very cheap based on what locals were handing over and the change they received. He carefully arranged his wad of notes in denomination order and unfolded the many crumpled notes he was given to ensure all were neatly aligned and held between the pages of the ticket book he carried. The bus pulled out of the station and we headed east. The front wheel seemed to be square as we collunked along. It became smoother the faster we went so all was good. The ticket collector called out the destinations as we drove through town and we collected a few more passengers. 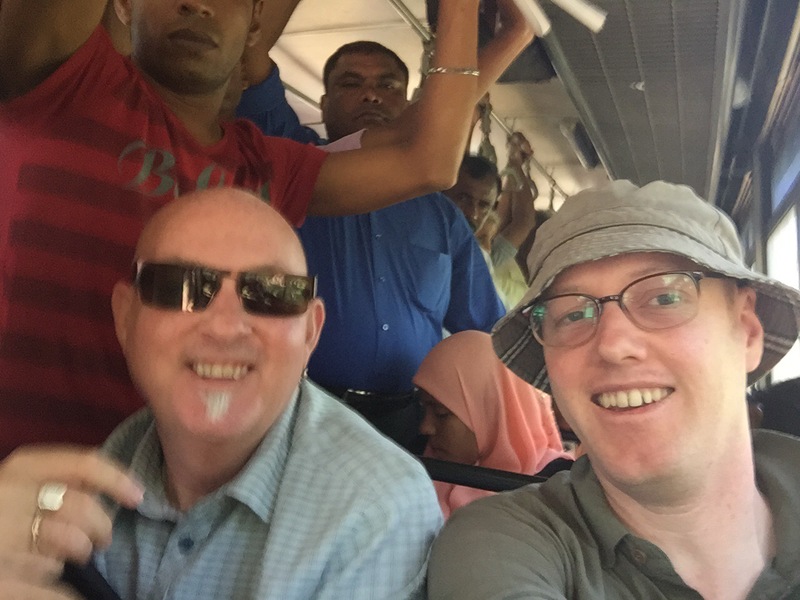 It seemed that an unwritten law is that no passenger can stand on the front steps – this is reserved for the ticket collector so even though our bus was full, when the next passenger got on they shuffled up into any available space. We then pulled into a petrol station and filled up – might have been short on cash and needed the ticket money to pay for the fuel – who knows!! It was rather disconcerting to notice the driver blessing himself every few minutes. This meant he removed both hands from the wheel and joined his hands in prayer position as a sense of calm passed over him. We assume this continued throughout the journey but it became so crowded that we soon lost sight of the driver across the aisle as we lurched forward towards our destination. Turning a corner, we discovered our seat was only attached on one side so we see-sawed back and forth for the trip. Bus stops are spread along the road but these serve only as a guide. People will often flag the bus down without a bus stop in sight and even when there is a marked stop, by the time the large beast stops, it may be 100m down the road. Even though we stopped many times, it was more of a slow down rather than a complete stop with passengers jumping on an off the slow moving vehicle. Our ticket collector worked hard, constantly moving through the bus to collect fairs and re-arranging his notes if he got a moment. After making his way through the bus to the back, instead of clambering over the passengers to get to the front, he would exit out the back door and run alongside during a momentary slow down to jump in the front door. The driver and he communicated with a series of grunts and shouts and all worked like a well oiled machine. Our arrival in the first major town meant a stop at the bus station. What this really meant was two laps of the bus station with people alighting and boarding as the ticket seller constantly called out our route. And onward we went. Single men and women, families, children and the elderly all joined us. At one stage, due to the sheer crowding, a woman was leaning in front of Christopher with her breasts mere centimetres from his face. At another stage we had to rescue a bag of one of our group as it slid towards the ever open front door. The entertainment wasn’t limited to the front door. Apparently locals down the back threw rubbish from the windows without the blinking of an eye. Members of our group also reported having various body parts pressed into them and thrust into their faces. At times it felt as if the bus was like a clown car in a circus as there was a constant stream of people entering and leaving the bus. We hurtled along, our bums going numb due to the lack of padding in the seats. We had a ten minute stop in one roadside cafe. Andrew braved the toilets – another story in itself!! Clearly marking his seat upon exiting, Christopher said he could have sold it for many rupees had he not returned, with many locals eyeing it off. After four hours we pulled into Polonnaruwa and climbed down from the blue beast. It had been an experience. As the bus pulled away and left us in a cloud of smoke, we looked at our itinerary and noticed we had another local bus trip tomorrow. 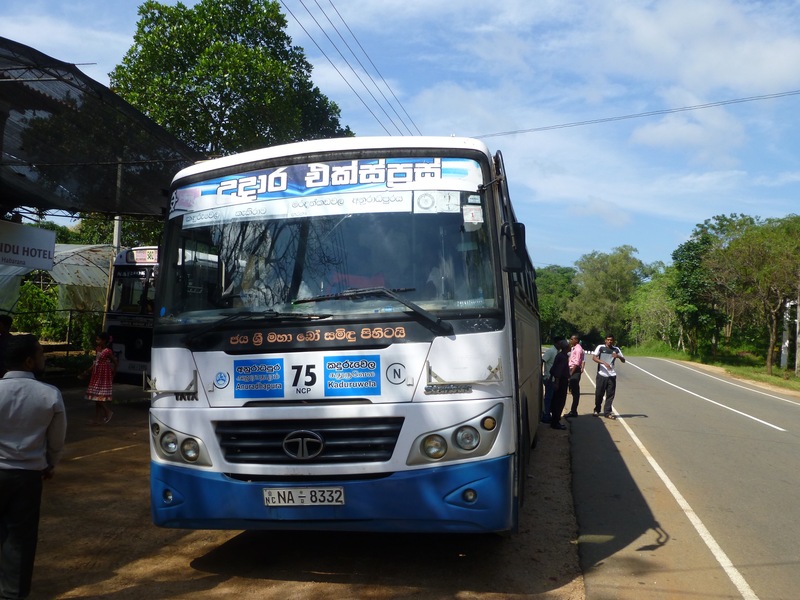 After having ridden the bus on the other Indian trip which you guys missed last time, it was great to relive the wonderful experience through you. And getting the front seat- it doesn’t get any better. Sounds like you are continuing to live the dream. Any time you get a wee bit too warm, just imagine Jenny in the Ross Sea playing with the penguins. Thanks for the posting. We check the computer daily to enjoy it together over coffee.